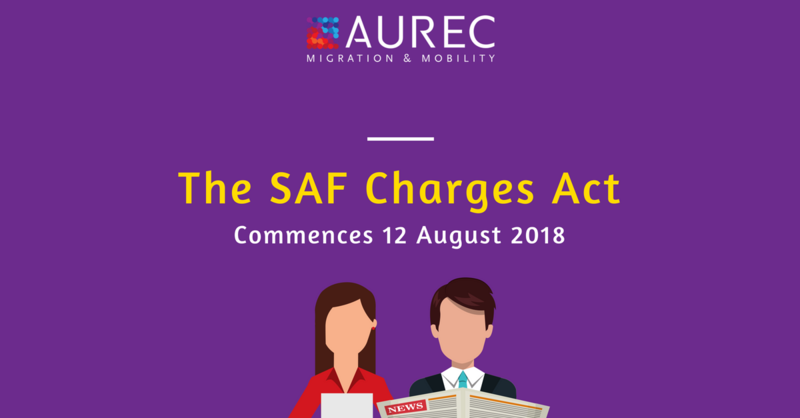 On 12 August 2018, the Skilling Australian Fund Charges Act commenced. This charge is imposed on employers who nominate workers for temporary or permanent skilled work visas. Below we have answered some frequently asked questions surrounding the new legislation. What is the Skilling Australian Fund Charges Act? The Skilling Australian Fund Levy (SAF Levy) replaces the training benchmarks scheme. The charge will vary depending on whether a business has an annual turnover of more or less than $10 million. Businesses with an annual turnover of $10 million or more will be required to pay $1,800 per year for each temporary worker and a one-off payment of $5,000 for each permanent worker. The SAF levy is based on the visa type and is payable per year, so for example, if a company who had an annual turnover of more than $10 million was to employ an overseas worker for a job that was on the medium term list for a TSS (482) visa, they would be required to contribute $1,800 per year for four years. There is no limitation to the amount of overseas workers a company employs. Which ones do we cover? No, all fees will be clearly laid out and transparant, throughout the entire process. Can we get a refund if an employee doesn’t work out? Will I be charged more for current sponsored employees? The SAF Levy only applies to visa applications made after 12 August 2018.